1. 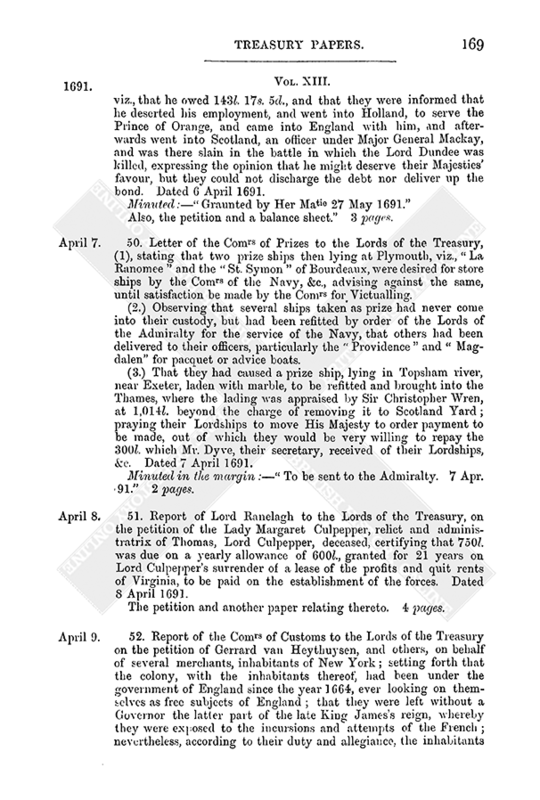 Presentment of the Comrs of Customs to the Lords of the Treasury concerning the right by the officers of customs to search ships of war, which right was resisted by commanders of such vessels, and more particularly at the port of Bristol, Capt Audley, commander of the “Smyrna” frigate, refused to allow the officers to visit the ship, moving their Lordships to issue directions on the subject. Dated 3 Feb. 1690. Minuted:—“A letter to Mr. Southerne (reciting this presentment) to desire the Lds of the Admiralty to give orders that all shipps of warr may be visited by the custom-house officrs. 31th March 1691.” 1 page. 2. 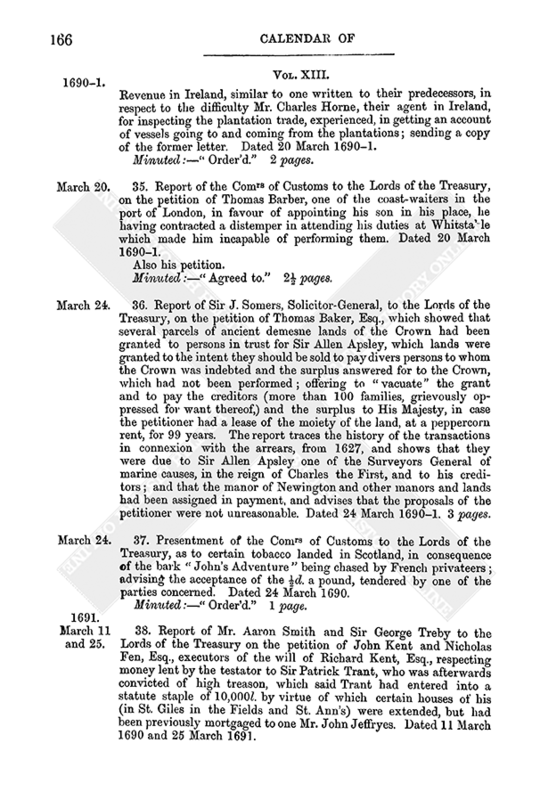 Report of Mr. Aaron Smith to the Lords of the Treasury on the petition of William Smith, who was dismissed for fraud and collusion, in the seizure of tobacco stalks, imported from Holland, and then lay in prison, still owing 127l. 19s. 2½d., recommending that he give a new judgment to their Majesties for that sum, with a release of errors, and covenant not to bring any writ of error, and that then he might be enlarged from prison. Dated 4 Feb. 1690. The Comrs of Customs' report on the case, the petition, and two other papers. 3 pages 2 halves. 3. Report of the Comrs of Customs to the Lords of the Treasury on the petition of Mr. William Bateman and other merchants of London, concerned in the ship “Arabella,” recommending that they be discharged from the Aliens duties, “in regard the surplusage of men were only taken in for her defence at this time of warr.” Dated 4 Feb. 1690. 4. Report of the Comrs of Customs to the Lords of the Treasury on the petition of Samuel Groome, merchant, and owner of the ship “Ruth” of London, praying to be allowed to change the same ship for another belonging to him for his trade to Virginia, stating that they have nothing to object. Dated 4 Feb. 1690. The said petition and another enclosure. 4 pages. 5. Report of Lord Ranelagh on the petition of Theophilus Allen, formerly surgeon-major in Colonel Lutterel's regiment, addressed to the Queen, which stated that he had supplied two chests of medicines for the King's service in the year 1689 to the value of 88l. 8s. ; that he was a poor refugee put out of his commission by Col. Lutterel, without knowing the reason, and that he was in danger of arrest; praying that he might be paid, confirming his demands. Dated 6 Feb. 1690–1. Another petition to the same effect, referred to the Lords of the Treasury by Order in Council 13 June 1691. Also petition in French to the same effect, with an additional clause praying for half the amount, if the whole cannot be paid him at once. 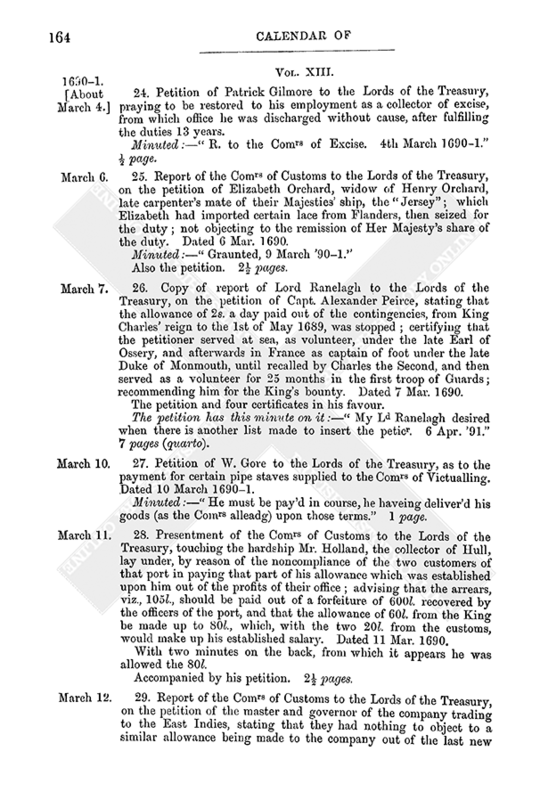 Copy of the report of Lord Ranelagh in his favour, and a paper setting forth his services to the King's cause. (In French.) 7 pages. 6. Petition of Henry Keales, addressed to the Queen, showing that he was very instrumental in detecting the late conspiracy to dethrone His Majesty; praying to be appointed a kings-waiter or land-waiter in the port of London. Minuted:—“Speak with the Comrs of the Customs 6th Febr. 1690–1. Recommended to the Comrs of the Customs to be presented to the first vacancy of a place that they find him qualified for. 9 Feb. 1690–1.” 1 page. 7. Copy of writ to the Sheriff of London commanding him to take John, Earl of Melfort, late of London, outlawed for high treason on 10 Feb., in the first year of the reign, and to make inquisition on his goods and chattels. The inquisition taken thereon, and an inventory of the goods and chattels, amongst which is a collection of paintings, amounting to 813l. value. Dated 10 Feb. 1690. [John, Earl of Melfort, was secretary to King James II.] 21 pages. 8. Letter of the Lords of the Admiralty to the Lords of the Treasury enclosing a copy of a representation received from the Comrs of Victualling the Navy as to the necessity of a supply of money for that service. Dated 11 Feb. 1690. The copy referred to. 3 pages. 9. Letter signed “B. Tonstall” and “Kath. Tonstall,” addressed to Mr. Jephson, concerning some matter in controversy between them and Mr. Williamson, which they were anxious to have heard before the Lords of the Treasury. With a postscript urging the impropriety of the case being heard before the Comrs of Customs. Minuted:—“To be consider'd when Mr Willsons report comes from the Custom House. 16 Febr. 1690–1.” 1 page (quarto). 10. Memorial of Jean Gasper Stein, secretary [of the Danish forces] stating that he had done his best to induce the tradesmen to be contented with their Lordships' word, and that of Mr. Blathwayt, but they would not deliver their goods without the tallies; the supply of clothing necessary for the troops in Ireland gave him uneasiness, as by the least delay the services of the King would be hindered, contrary to the inclination of the Duke of Wirtemburg. (French.) Dated 16 Feb. 1691. Accompanied by another letter on the same subject. Dated 10 Feb. 1690–91. 2 pages. 11. Petition of John Kynvin, addressed to the Lords of the Treasury, showing that he had lost to the value of 1,000l. by the resolution of King Charles II. in quitting Tangier, and that he was appointed a landing-waiter in the port of London, as a compensation, by patent, dated 19 Aug. 1686; praying to be allowed to resign the office to Thomas Wells, gent., who was well qualified for the station. Minuted:—“He shall resign, provided it be to a person that the Comrs of the Customs shall approve, capable of acting himselfe, or that he will allow 20li per ann. to such deputy as shall be approved of by this Board.” 18 Feb. 1690–1. 1 page. 12. Report of the Comrs of Excise to the Lords of the Treasury on the petition of Abram Hubert, of the island of Jersey, relating to a parcel of brandy imported from Jersey, which he was desirous of being allowed to sell to prevent loss, having shipped the same in ignorance that there was a duty of 8s. a gallon lately laid on it. Dated 18 Feb. 1690. The petition, and four other enclosures, one of which is the Comrs of Customs' report thereon. Minuted:—“They may carry the brandy back again if the Comrs of the Excise have no objection to it.” 10 Feb. 1690–1. 7 pages. 13. Order of the Queen in Council on a report, founded on the petition of Sir Polycarpus Wharton, Bart., to have money imprested to him to carry on the powder works at Chilworth. Dated 19 Feb. 1690. The petition referred to and report of certain officers of the Ordnance. Also another petition from him respecting arrears of near 3,000l., due from the Ordnance, with an enclosure, showing that materials for making powder can only be provided in the months of February, March, and April. 6 pages. 14. Presentment of the Comrs of Excise to the “Lords Commissionrs of their Majties Revenue (fn. 1) of Excise,” stating that they had received a complaint from the officers of excise for the town of Bedford, that the Mayor and justices had suppressed 16 victuallers in that town and parts adjacent, which matter was afterwards heard before the King in Council, and orders given that such as had kept orderly houses should have their licences restored; notwithstanding which the Mayor and justices rejected them all but one of the most inconsiderable, to the detriment of the excise. Dated 20 Feb. 1690–91. Also two enclosures. 3 pages. 15. 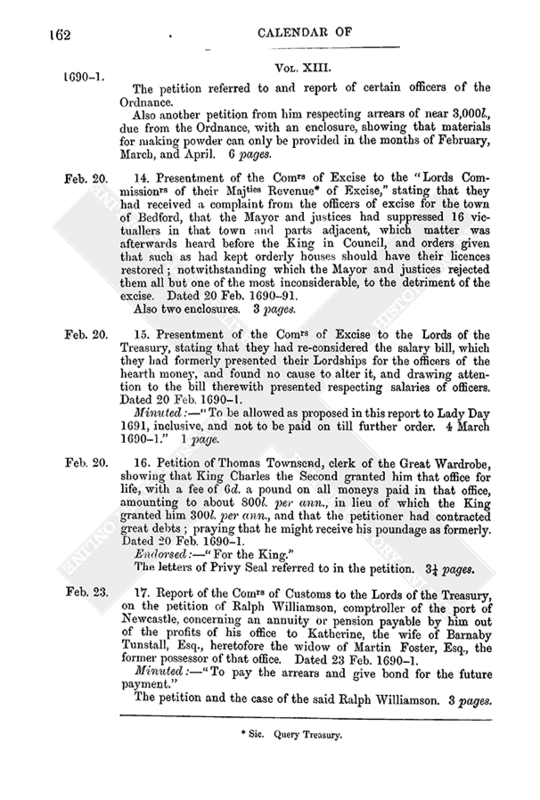 Presentment of the Comrs of Excise to the Lords of the Treasury, stating that they had re-considered the salary bill, which they had formerly presented their Lordships for the officers of the hearth money, and found no cause to alter it, and drawing attention to the bill therewith presented respecting salaries of officers. Dated 20 Feb. 1690–1. Minuted:—“To be allowed as proposed in this report to Lady Day 1691, inclusive, and not to be paid on till further order. 4 March 1690–1.” 1 page. 16. Petition of Thomas Townsend, clerk of the Great Wardrobe, showing that King Charles the Second granted him that office for life, with a fee of 6d. a pound on all moneys paid in that office, amounting to about 800l. per ann., in lieu of which the King granted him 300l. per ann., and that the petitioner had contracted great debts; praying that he might receive his poundage as formerly. Dated 20 Feb. 1690–1. The letters of Privy Seal referred to in the petition. 3¼ pages. 17. Report of the Comrs of Customs to the Lords of the Treasury, on the petition of Ralph Williamson, comptroller of the port of Newcastle, concerning an annuity or pension payable by him out of the profits of his office to Katherine, the wife of Barnaby Tunstall, Esq., heretofore the widow of Martin Foster, Esq., the former possessor of that office. Dated 23 Feb. 1690–1. The petition and the case of the said Ralph Williamson. 3 pages. 18. Letter, signed Charles Pigeon, to William Jephson, Esq., stating that the Countess of Dorchester desired the favour of him to certify that there was no pension paid upon her patent since Michaelmas 1688, or that the Lords of the Treasury had not thought fit to do anything therein, so that she might have a foundation to proceed on in Ireland. Dated 28 Feb. 1690. Minuted:—“For the patent the certificate must come from the Exchequer, and may have a note that my Lds have not pay'd any thing on her pencion.” 2 March 1690–1. 1 page (quarto). 19. Lists of mariners returned by the constables in various parishes in Clerkenwell, and where they lodged. Dated in Feb. 1690. See other papers belonging to this return. About 21 Jan. 1690–1. (15.) 5 parts of pages. 20. Report of Mr. Aaron Smith to the Lords of the Treasury, on the petition of James Allan and others, clothiers of a regiment of foot in Flanders; apparently advising that the petitioners should have their Majesties' aid in recovering the money due on a bill of exchange. Dated … Feb. 1690. Also the petition and an affidavit. The remains of 6 leaves (in a very decayed state). 21. Report of Mr. W. Harbord, Surveyor, to the Lords of the Treasury, stating that he had considered the petition of Mr. Thomas Howell, as to the office of constable of the castle of Launceston, in Cornwall, which had been granted by King Charles II. to Sir Hugh Piper, Knt., and to his son and grandson, and that the castle was certified by the parliamentary survey of 1650 to be much in decay, and only two rooms standing, which were used for criminal prisoners; in favour of the prayer of the petition, which sought for the grant of the reversion of the office for two lives, with the fee of 13l. 6s. 8d., the petitioner offering to put the gaol in good repair at the expense of 120l., and to keep it so. Dated 3 Mar. 1690–1. Minuted:—“Mr. Chancellour will give an account of this. 5th Janry '91–2. A clause for the patentees to keep the castle in repair.” 2¼ pages. 22. Petition of Thomas Amy, late one of the Receivers-General of the hearth-money, to the Lords of the Treasury, for suspension of proceedings against him for a debt of 400l. Minuted:—“The officers of the … to state the debt.” 4 March 1690–1. 1 large page. 23. Presentment of the Comrs of Customs to the Lords of the Treasury, concerning the reception of cracked money of the current coin of the realm by the collector of the port of Colchester. Dated 4 March 1690–1. Minuted:—“Ordered 9th March '90–1.” 1 page. 24. Petition of Patrick Gilmore to the Lords of the Treasury, praying to be restored to his employment as a collector of excise, from which office he was discharged without cause, after fulfilling the duties 13 years. Minuted:—“R. to the Comrs of Excise. 4th March 1690–1.” ½ page. 25. Report of the Comrs of Customs to the Lords of the Treasury, on the petition of Elizabeth Orchard, widow of Henry Orchard, late carpenter's mate of their Majesties' ship, the “Jersey”; which Elizabeth had imported certain lace from Flanders, then seized for the duty; not objecting to the remission of Her Majesty's share of the duty. Dated 6 Mar. 1690. Also the petition. 2½ pages. 26. Copy of report of Lord Ranelagh to the Lords of the Treasury, on the petition of Capt. Alexander Peirce, stating that the allowance of 2s. a day paid out of the contingencies, from King Charles' reign to the 1st of May 1689, was stopped; certifying that the petitioner served at sea, as volunteer, under the late Earl of Ossery, and afterwards in France as captain of foot under the late Duke of Monmouth, until recalled by Charles the Second, and then served as a volunteer for 25 months in the first troop of Guards; recommending him for the King's bounty. Dated 7 Mar. 1690. The petition and four certificates in his favour. The petition has this minute on it:—“My Ld Ranelagh desired when there is another list made to insert the peticr. 6 Apr. '91.” 7 pages (quarto). 27. Petition of W. Gore to the Lords of the Treasury, as to the payment for certain pipe staves supplied to the Comrs of Victualling. Dated 10 March 1690–1. Minuted:—“He must be pay'd in course, he haveing deliver'd his goods (as the Comrs alleadg) upon those terms.” 1 page. 28. Presentment of the Comrs of Customs to the Lords of the Treasury, touching the hardship Mr. Holland, the collector of Hull, lay under, by reason of the noncompliance of the two customers of that port in paying that part of his allowance which was established upon him out of the profits of their office; advising that the arrears, viz., 105l., should be paid out of a forfeiture of 600l. recovered by the officers of the port, and that the allowance of 60l. from the King be made up to 80l., which, with the two 20l. from the customs, would make up his established salary. Dated 11 Mar. 1690. With two minutes on the back, from which it appears he was allowed the 80l. Accompanied by his petition. 2½ pages. 29. Report of the Comrs of Customs to the Lords of the Treasury, on the petition of the master and governor of the company trading to the East Indies, stating that they had nothing to object to a similar allowance being made to the company out of the last new impositions, as was made previously, viz., 4½ per cent. on the last new impost of 10 per cent. upon the value of their calicoes, wrought silks, &c., granted in the time of the late King James. Dated 12 Mar. 1690. 30. 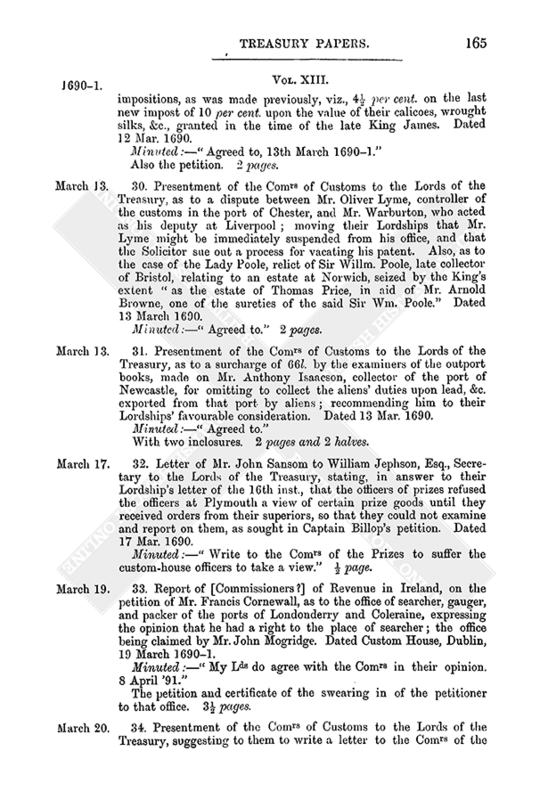 Presentment of the Comrs of Customs to the Lords of the Treasury, as to a dispute between Mr. Oliver Lyme, controller of the customs in the port of Chester, and Mr. Warburton, who acted as his deputy at Liverpool; moving their Lordships that Mr. Lyme might be immediately suspended from his office, and that the Solicitor sue out a process for vacating his patent. Also, as to the case of the Lady Poole, relict of Sir Willm. Poole, late collector of Bristol, relating to an estate at Norwich, seized by the King's extent “as the estate of Thomas Price, in aid of Mr. Arnold Browne, one of the sureties of the said Sir Wm. Poole.” Dated 13 March 1690. 31. 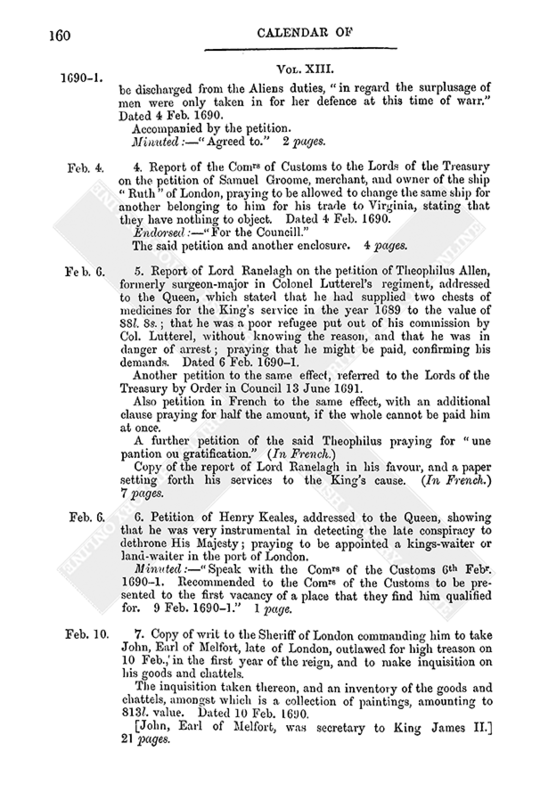 Presentment of the Comrs of Customs to the Lords of the Treasury, as to a surcharge of 66l. by the examiners of the outport books, made on Mr. Anthony Isaacson, collector of the port of Newcastle, for omitting to collect the aliens' duties upon lead, &c. exported from that port by aliens; recommending him to their Lordships' favourable consideration. Dated 13 Mar. 1690. With two inclosures. 2 pages and 2 halves. 32. Letter of Mr. John Sansom to William Jephson, Esq., Secretary to the Lords of the Treasury, stating, in answer to their Lordship's letter of the 16th inst., that the officers of prizes refused the officers at Plymouth a view of certain prize goods until they received orders from their superiors, so that they could not examine and report on them, as sought in Captain Billop's petition. Dated 17 Mar. 1690. Minuted:—“Write to the Comrs of the Prizes to suffer the custom-house officers to take a view.” ½ page. 33. Report of [Commissioners?] of Revenue in Ireland, on the petition of Mr. Francis Cornewall, as to the office of searcher, gauger, and packer of the ports of Londonderry and Coleraine, expressing the opinion that he had a right to the place of searcher; the office being claimed by Mr. John Mogridge. Dated Custom House, Dublin, 19 March 1690–1. The petition and certificate of the swearing in of the petitioner to that office. 3½ pages. 34. 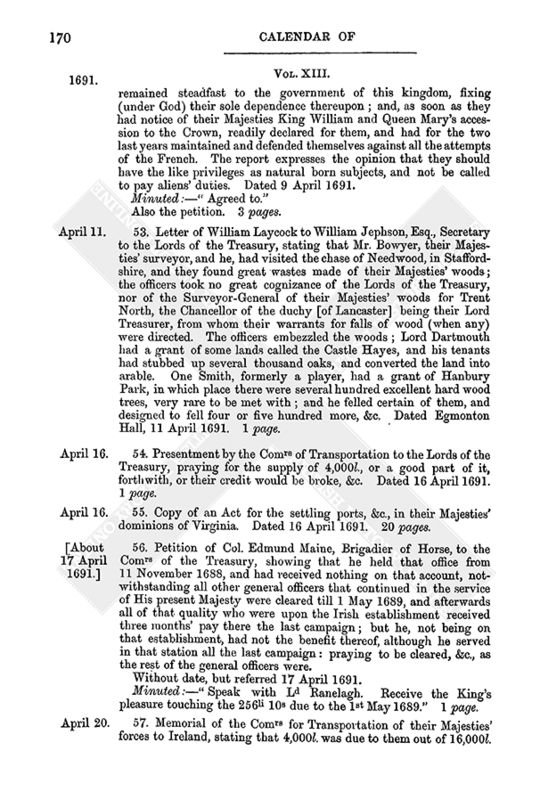 Presentment of the Comrs of Customs to the Lords of the Treasury, suggesting to them to write a letter to the Comrs of the Revenue in Ireland, similar to one written to their predecessors, in respect to the difficulty Mr. Charles Horne, their agent in Ireland, for inspecting the plantation trade, experienced, in getting an account of vessels going to and coming from the plantations; sending a copy of the former letter. Dated 20 March 1690–1. 35. Report of the Comrs of Customs to the Lords of the Treasury, on the petition of Thomas Barber, one of the coast-waiters in the port of London, in favour of appointing his son in his place, he having contracted a distemper in attending his duties at Whitsta' le which made him incapable of performing them. Dated 20 March 1690–1. 36. Report of Sir J. Somers, Solicitor-General, to the Lords of the Treasury, on the petition of Thomas Baker, Esq., which showed that several parcels of ancient demesne lands of the Crown had been granted to persons in trust for Sir Allen Apsley, which lands were granted to the intent they should be sold to pay divers persons to whom the Crown was indebted and the surplus answered for to the Crown, which had not been performed; offering to “vacuate” the grant and to pay the creditors (more than 100 families, grievously oppressed for want thereof,) and the surplus to His Majesty, in case the petitioner had a lease of the moiety of the land, at a peppercorn rent, for 99 years. The report traces the history of the transactions in connexion with the arrears, from 1627, and shows that they were due to Sir Allen Apsley one of the Surveyors General of marine causes, in the reign of Charles the First, and to his creditors; and that the manor of Newington and other manors and lands had been assigned in payment, and advises that the proposals of the petitioner were not unreasonable. Dated 24 March 1690–1. 3 pages. 37. Presentment of the Comrs of Customs to the Lords of the Treasury, as to certain tobacco landed in Scotland, in consequence of the bark “John's Adventure” being chased by French privateers; advising the acceptance of the ½d. a pound, tendered by one of the parties concerned. Dated 24 March 1690. 38. 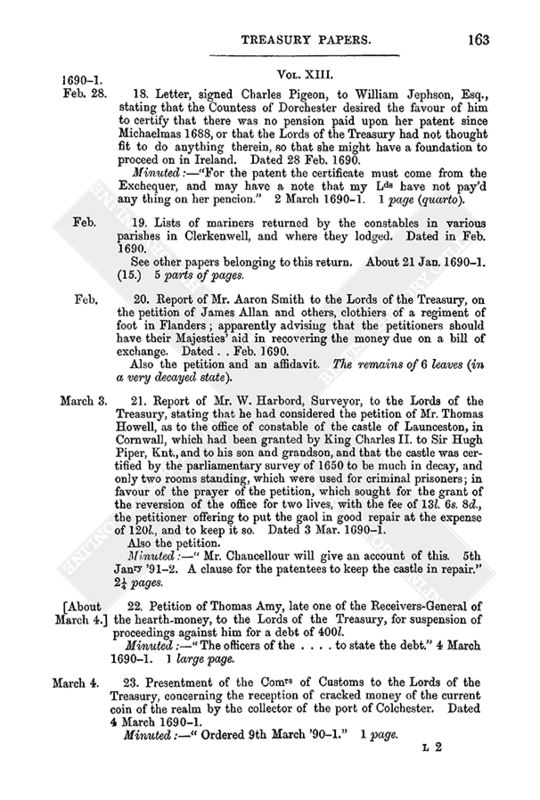 Report of Mr. Aaron Smith and Sir George Treby to the Lords of the Treasury on the petition of John Kent and Nicholas Fen, Esq., executors of the will of Richard Kent, Esq., respecting money lent by the testator to Sir Patrick Trant, who was afterwards convicted of high treason, which said Trant had entered into a statute staple of 10,000l. by virtue of which certain houses of his (in St. Giles in the Fields and St. Ann's) were extended, but had been previously mortgaged to one Mr. John Jeffryes. Dated 11 March 1690 and 25 March 1691. The petition and a particular of the houses and the rents of them. 7 pages. 39. Report of the Comrs of Customs to the Lords of the Treasury, on the petition of Daniel Kroger, of East Smithfield, ship-broker, in favour of granting him His Majesty's part of a forfeiture, in consequence of a wrong report of the lading of a ship called “the Hope of Stralsound.” Dated 27 March 1691. Also the petition and “case.” 3 pages. 40. Report of the Comrs of Excise to the Lords of the Treasury, on the petition of Christopher Billopp, as to the duty of excise payable on brandies and wines therein mentioned, brought into Plymouth. Dated 27 March 1691. Also the petition referred to, a report of the Comrs of Customs, and two other papers. 4½ pages. 41. A certificate signed by the Earl of Marlborough to the effect that Sir John Edgworth's regiment was ordered not to muster from 1 Jan. 1688 to about 1 April following. Dated 27 March 1691. Also a certificate to the same effect on the back, signed “D. Crauford.” A few lines only. 42. 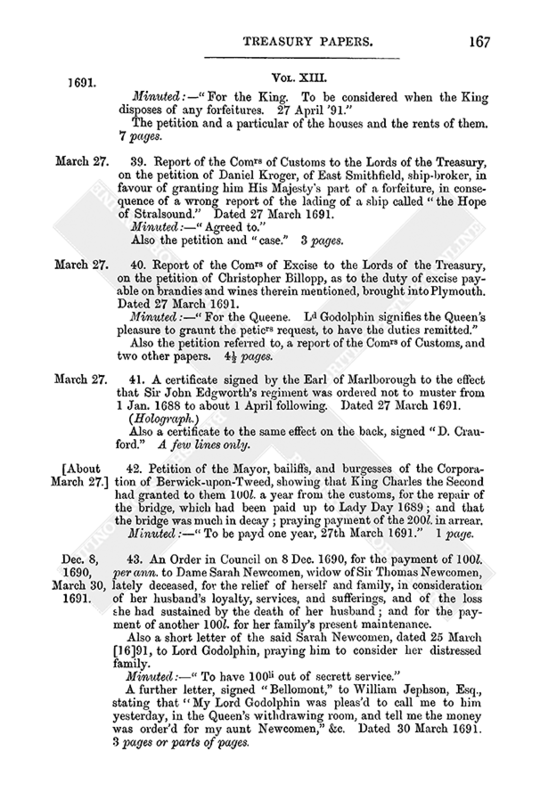 Petition of the Mayor, bailiffs, and burgesses of the Corporation of Berwick-upon-Tweed, showing that King Charles the Second had granted to them 100l. a year from the customs, for the repair of the bridge, which had been paid up to Lady Day 1689; and that the bridge was much in decay; praying payment of the 200l. in arrear. 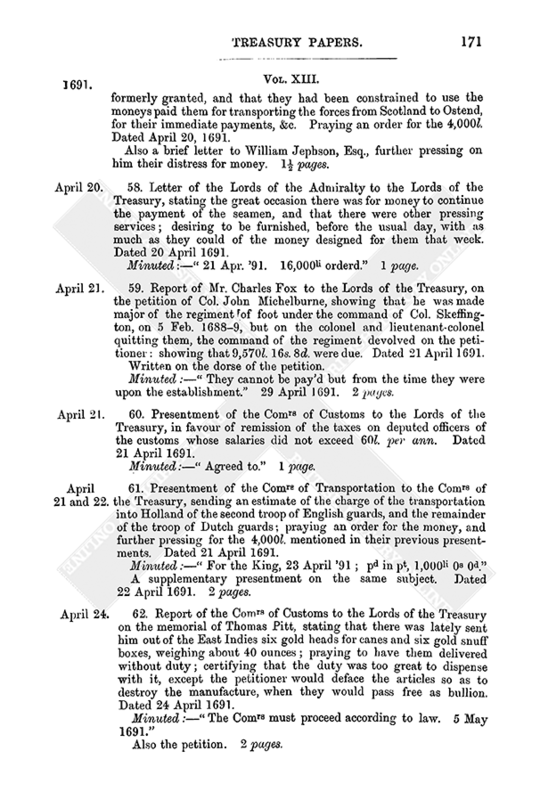 Minuted:—“To be payd one year, 27th March 1691.” 1 page. 43. An Order in Council on 8 Dec. 1690, for the payment of 100l. per ann. to Dame Sarah Newcomen, widow of Sir Thomas Newcomen, lately deceased, for the relief of herself and family, in consideration of her husband's loyalty, services, and sufferings, and of the loss she had sustained by the death of her husband; and for the payment of another 100l. for her family's present maintenance. Also a short letter of the said Sarah Newcomen, dated 25 March 91, to Lord Godolphin, praying him to consider her distressed family. A further letter, signed “Bellomont,” to William Jephson, Esq., stating that “My Lord Godolphin was pleas'd to call me to him yesterday, in the Queen's withdrawing room, and tell me the money was order'd for my aunt Newcomen,” &c. Dated 30 March 1691. 3 pages or parts of pages. Also copies of two certificates corroborating her case. Dated 6 and 13 March 1690–1. 2 pages. 45. Petition of Col. Francis Lutterel for himself and the other officers in his regiment, addressed to the King, showing that on the King's arrival in this kingdom, he had given him a commission to raise a regiment, which he did in three days, and kept them 14 days at his own expense; he clothed the regiment at Exeter at a cost of 1,500l. ; but he was so extremely abused (the clothes being worn out) that they must be clothed anew; praying that the regiment might be cleared from the beginning of January to 1 July last, to enable him to pay for the old clothes. Undated; but see an order for payment for the clothing of his regiment in the Money Book, Vol. II. p. 21. With a minute that it was referred to Lord Ranelagh. 1 page. 46. Proposal of Thomas Baker and Peter Stepkin, Esq., to the Lords of the Treasury, for the recovery of moneys received from Dissenters by virtue of penal statutes and not paid into the Treasury. Dated 3 April 1691. Minuted:—“They are to proceed according to law at their owne charge & to have one third part of what they do recover & they are to pay the same (as fast as it is recover'd) into the Exchequer. 7 Apr. '91.” 1 page. 47. 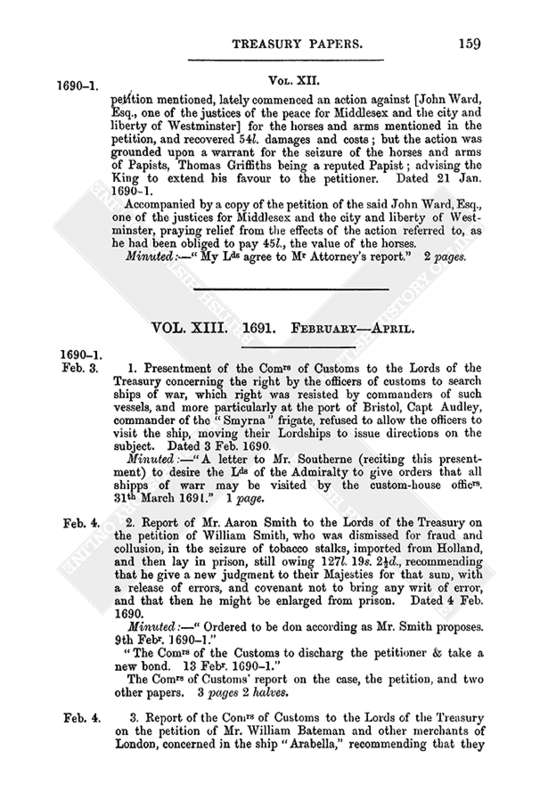 Report of the Comrs of Customs to the Lords of the Treasury, on the petition of Joel Freemolt and others, stating that they were employed in preventing the exportation of wool, and by their diligence made several seizures at the hazard of their lives; confirming the truth of the petition. Dated 3 April 1691. Also, the petition and four other enclosures. Dated 3 April 1691. 1 page and 5 half pages. 48. 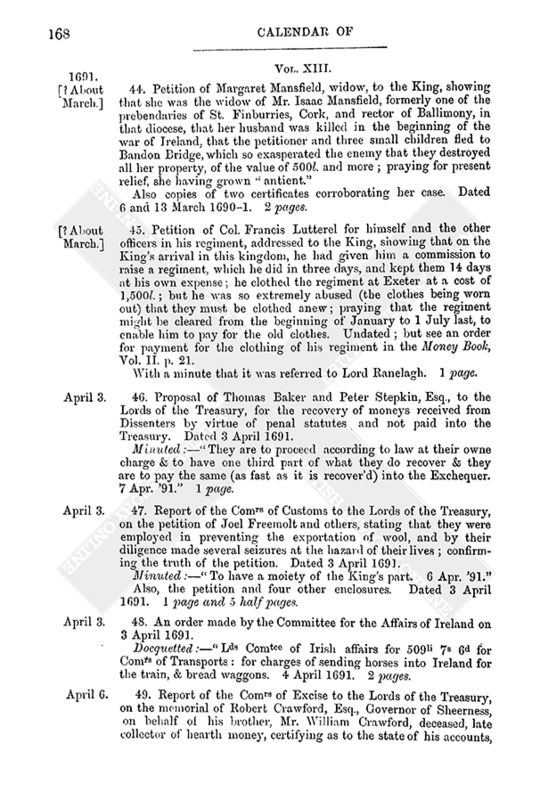 An order made by the Committee for the Affairs of Ireland on 3 April 1691. Docquetted:—“Lds Comtee of Irish affairs for 509li 7s 6d for Comrs of Transports: for charges of sending horses into Ireland for the train, & bread waggons. 4 April 1691. 2 pages. 49. Report of the Comrs of Excise to the Lords of the Treasury, on the memorial of Robert Crawford, Esq., Governor of Sheerness, on behalf of his brother, Mr. William Crawford, deceased, late collector of hearth money, certifying as to the state of his accounts, viz., that he owed 143l. 17s. 5d., and that they were informed that he deserted his employment, and went into Holland, to serve the Prince of Orange, and came into England with him, and afterwards went into Scotland, an officer under Major General Mackay, and was there slain in the battle in which the Lord Dundee was killed, expressing the opinion that he might deserve their Majesties' favour, but they could not discharge the debt nor deliver up the bond. Dated 6 April 1691. Also, the petition and a balance sheet.” 3 pages. 50. Letter of the Comrs of Prizes to the Lords of the Treasury, (1), stating that two prize ships then lying at Plymouth, viz., “La Ranomee” and the “St. Symon” of Bourdeaux, were desired for store ships by the Comrs of the Navy, &c., advising against the same, until satisfaction be made by the Comrs for Victualling. (2.) Observing that several ships taken as prize had never come into their custody, but had been refitted by order of the Lords of the Admiralty for the service of the Navy, that others had been delivered to their officers, particularly the “Providence” and “Magdalen” for pacquet or advice boats. (3.) That they had caused a prize ship, lying in Topsham river, near Exeter, laden with marble, to be refitted and brought into the Thames, where the lading was appraised by Sir Christopher Wren, at 1,014l. beyond the charge of removing it to Scotland Yard; praying their Lordships to move His Majesty to order payment to be made, out of which they would be very willing to repay the 300l. which Mr. Dyve, their secretary, received of their Lordships, &c. Dated 7 April 1691. Minuted in the margin:—“To be sent to the Admiralty. 7 Apr. 91.” 2 pages. 51. Report of Lord Ranelagh to the Lords of the Treasury, on the petition of the Lady Margaret Culpepper, relict and administratrix of Thomas, Lord Culpepper, deceased, certifying that 750l. was due on a yearly allowance of 600l., granted for 21 years on Lord Culpepper's surrender of a lease of the profits and quit rents of Virginia, to be paid on the establishment of the forces. Dated 8 April 1691. The petition and another paper relating thereto. 4 pages. 52. Report of the Comrs of Customs to the Lords of the Treasury on the petition of Gerrard van Heythuysen, and others, on behalf of several merchants, inhabitants of New York; setting forth that the colony, with the inhabitants thereof, had been under the government of England since the year 1664, ever looking on themselves as free subjects of England; that they were left without a Governor the latter part of the late King James's reign, whereby they were exposed to the incursions and attempts of the French; nevertheless, according to their duty and allegiance, the inhabitants remained steadfast to the government of this kingdom, fixing (under God) their sole dependence thereupon; and, as soon as they had notice of their Majesties King William and Queen Mary's accession to the Crown, readily declared for them, and had for the two last years maintained and defended themselves against all the attempts of the French. The report expresses the opinion that they should have the like privileges as natural born subjects, and not be called to pay aliens' duties. Dated 9 April 1691. Also the petition. 3 pages. 53. Letter of William Laycock to William Jephson, Esq., Secretary to the Lords of the Treasury, stating that Mr. Bowyer, their Majesties' surveyor, and he, had visited the chase of Needwood, in Staffordshire, and they found great wastes made of their Majesties' woods; the officers took no great cognizance of the Lords of the Treasury, nor of the Surveyor-General of their Majesties' woods for Trent North, the Chancellor of the duchy [of Lancaster] being their Lord Treasurer, from whom their warrants for falls of wood (when any) were directed. The officers embezzled the woods; Lord Dartmouth had a grant of some lands called the Castle Hayes, and his tenants had stubbed up several thousand oaks, and converted the land into arable. One Smith, formerly a player, had a grant of Hanbury Park, in which place there were several hundred excellent hard wood trees, very rare to be met with; and he felled certain of them, and designed to fell four or five hundred more, &c. Dated Egmonton Hall, 11 April 1691. 1 page. 54. Presentment by the Comrs of Transportation to the Lords of the Treasury, praying for the supply of 4,000l., or a good part of it, forthwith, or their credit would be broke, &c. Dated 16 April 1691. 1 page. 55. Copy of an Act for the settling ports, &c., in their Majesties' dominions of Virginia. Dated 16 April 1691. 20 pages. 56. Petition of Col. Edmund Maine, Brigadier of Horse, to the Comrs of the Treasury, showing that he held that office from 11 November 1688, and had received nothing on that account, notwithstanding all other general officers that continued in the service of His present Majesty were cleared till 1 May 1689, and afterwards all of that quality who were upon the Irish establishment received three months' pay there the last campaign; but he, not being on that establishment, had not the benefit thereof, although he served in that station all the last campaign: praying to be cleared, &c., as the rest of the general officers were. Without date, but referred 17 April 1691. Minuted:—“Speak with Ld Ranelagh. Receive the King's pleasure touching the 256li 10s due to the 1st May 1689.” 1 page. 57. Memorial of the Comrs for Transportation of their Majesties' forces to Ireland, stating that 4,000l. was due to them out of 16,000l. formerly granted, and that they had been constrained to use the moneys paid them for transporting the forces from Scotland to Ostend, for their immediate payments, &c. Praying an order for the 4,000l. Dated April 20, 1691. Also a brief letter to William Jephson, Esq., further pressing on him their distress for money. 1½ pages. 58. Letter of the Lords of the Admiralty to the Lords of the Treasury, stating the great occasion there was for money to continue the payment of the seamen, and that there were other pressing services; desiring to be furnished, before the usual day, with as much as they could of the money designed for them that week. Dated 20 April 1691. Minuted:—“21 Apr. '91. 16,000li orderd.” 1 page. 59. Report of Mr. Charles Fox to the Lords of the Treasury, on the petition of Col. John Michelburne, showing that he was made major of the regiment of foot under the command of Col. Skeffington, on 5 Feb. 1688–9, but on the colonel and lieutenant-colonel quitting them, the command of the regiment devolved on the petitioner: showing that 9,570l. 16s. 8d. were due. Dated 21 April 1691. Written on the dorse of the petition. Minuted:—“They cannot be pay'd but from the time they were upon the establishment.” 29 April 1691. 2 pages. 60. 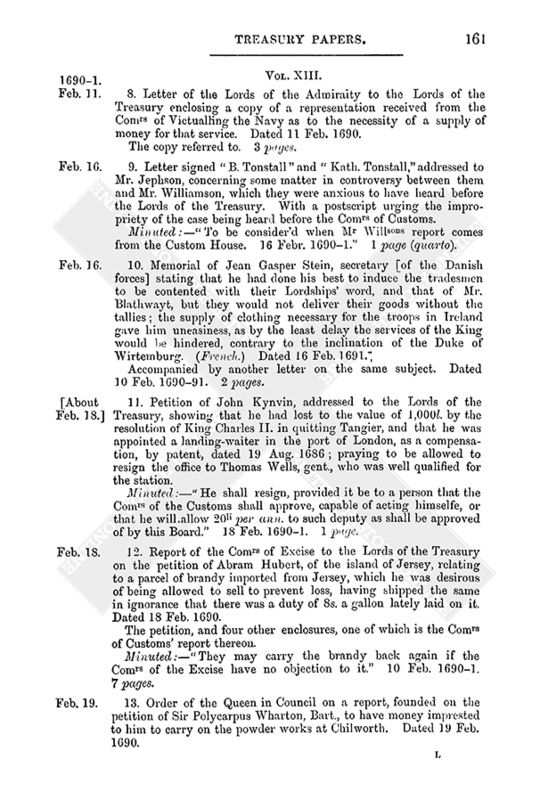 Presentment of the Comrs of Customs to the Lords of the Treasury, in favour of remission of the taxes on deputed officers of the customs whose salaries did not exceed 60l. per ann. Dated 21 April 1691. 61. Presentment of the Comrs of Transportation to the Comrs of the Treasury, sending an estimate of the charge of the transportation into Holland of the second troop of English guards, and the remainder of the troop of Dutch guards; praying an order for the money, and further pressing for the 4,000l. mentioned in their previous presentments. Dated 21 April 1691. A supplementary presentment on the same subject. Dated 22 April 1691. 2 pages. 62. Report of the Comrs of Customs to the Lords of the Treasury on the memorial of Thomas Pitt, stating that there was lately sent him out of the East Indies six gold heads for canes and six gold snuff boxes, weighing about 40 ounces; praying to have them delivered without duty; certifying that the duty was too great to dispense with it, except the petitioner would deface the articles so as to destroy the manufacture, when they would pass free as bullion. Dated 24 April 1691. 63. Presentment of the Comrs of Transportation to the Lords of the Treasury, referring to their former estimates for transporting horses and troops into Holland, stating that they had calculated the freight of the horses at 50s., but the masters had taken advantage and raised it to 55s. ; they were since required to provide for 34 horses more, which would make the amount required 2,182l. 13s. 9d. ; the 1,000l. their Lordships had ordered was almost all run out, and they prayed for the immediate supply of the remaining money, together with the remainder of the 16,000l. Also, sending an estimate for the transport of 700 recruit horses and riders, from Highlake into Ireland, and 300 horses and riders from Biddeford into Ireland, amounting to 2,958l. 15s. Dated April 28, 1691. Minuted:—“30 April '91, paid in parte 1,000li.” 1½ pages. 64. The case of William Abernathie, one of their Majesties' pensioners, showing that he served King Charles II. from 16 years of age till the battle of Worcester; he was then under the Earl of Middleton in Scotland, then in the King of Sweden's service, then he was recalled to serve His Majesty in exile in Flanders; that he did considerable service to the Restoration, and having followed His Majesty's service in the worst of times, all the reward he had was to ride in his guards for a year at great expense for nothing; and having served in all above 30 years so that he was thought deserving of 17s. a day in pay, he had but 3s. pension, &c.
With a memorandum in the Earl of Marlborough's handwriting, and signed by him in his favour. Dated 30 April '91. 1 page. 65. 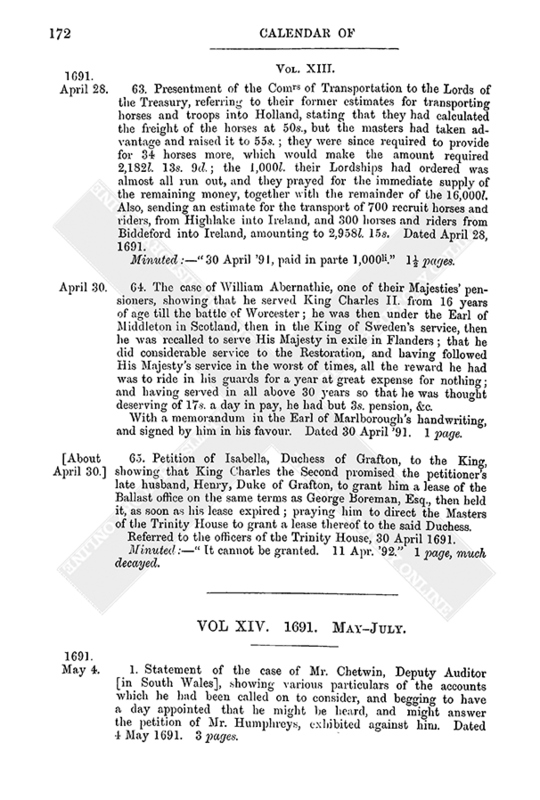 Petition of Isabella, Duchess of Grafton, to the King, showing that King Charles the Second promised the petitioner's late husband, Henry, Duke of Grafton, to grant him a lease of the Ballast office on the same terms as George Boreman, Esq., then held it, as soon as his lease expired; praying him to direct the Masters of the Trinity House to grant a lease thereof to the said Duchess. Referred to the officers of the Trinity House, 30 April 1691. Minuted:—“It cannot be granted. 11 Apr. '92.” 1 page, much decayed.